Imagine yourself in the idyllic French countryside in the 1930’s. Sometime before dark, a gypsy caravan sets up camp in a field outside of town, luring the locals out for an evening’s fun. The wanderers travel with a film projector, pointing it at the side of a barn. As the images flicker to life beneath the stars, gypsy musicians play their guitars and fiddles, matching every movement on the screen with characteristic virtuosity, passion and humor. 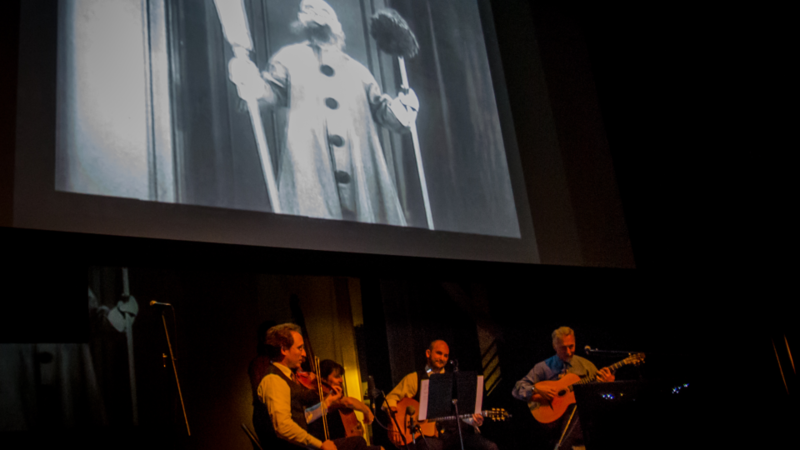 Reviving this lost entertainment, The Hot Club of San Francisco presents Cinema Vivant, an evening of vintage silent films accompanied by live gypsy swing. Cinema Vivant is a celebration of imagination and innovation. Before World War I, European filmmaker Ladislaw Starewicz pioneered stop-action animation, creating a never-before-seen movie experience. A gifted storyteller who used the new medium of animation to illuminate his fantastic imaginings of the secret lives of ordinary objects, Starewicz has become an obscure cult hero. Two Starewicz films are featured in Cinema Vivant—The Cameraman’s Revenge, a charming piece about the marital troubles of beetles and The Mascot, an adventure story about lost toys. On the other side of the Atlantic, American Charley Bowers revolutionized the industry in the 1920’s by combining animation with live action. There It Is, a recently rediscovered film by Bowers, is a whimsical comedy about a mysterious occurrence investigated by Scotland Yard.